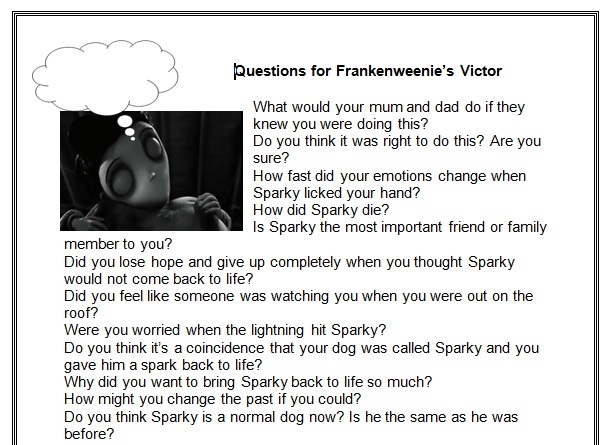 Using the National Curriculum Framework for Film Narrative, I have devised a unit which uses Frankenweenie as a basis for discussion and writing. This comes off the back of a unit of work on Mary Shelley's Frankenstein, which we studied in Older Literature. You will find the film stills as well as some ideas that came out of discussion and during some hot-seating of the key characters. I have also created a mock end of year test based on the narrative work (the year can be edited as you wish, as can the task). Please feel free to use these resources as you wish but pass on the word about this website and remember that I always welcome feedback or suggestions on the site.